Being part of a new family, I get to experience new traditions. One of my favorite so far is having fondue on Christmas Eve. Jess and her family have been doing this for years, but it’s new to me, and it’s a lot of fun. What’s great about all this is I get to bring my family traditions and she gets to bring hers and every now-and-again we make new ones. One tradition started two years ago has been sharpening our knives on Christmas. [I know I started talking about Jess here and “us”, but her Dad’s in the story so it counts.] We started this on a Christmas when both sides of the family were present for dinner at my in-laws’ house. My Dad suggested his knife needed sharpening and he had no stone to do this. My father-in-law of course had one and we retired to the garage while the women continued preparing in the kitchen. [Woman of the world, this technique of sending men to the garage is extremely effective in removing them from the kitchen for prolonged periods of time.] Now at this time, the three of us were carrying the same kind of Kershaw knife called the Chive. My father-in-law had the first one, and after I commented on it, he purchased one for me. He also bought one for my Dad after he commented on mine. [And I think both of them have purchased it for at least one other person, it’s that good.] I can honestly say it’s the first knife I ever carried on a regular basis. The one I had before this one lost its handle after about a week’s worth of use. While no man really needs an excuse to visit the garage, this activity provides us with a good one. My father-in-law placed the stone on the workbench and we took turns sharpening our knives, testing the edge on our thumbs while another sharpened theirs. 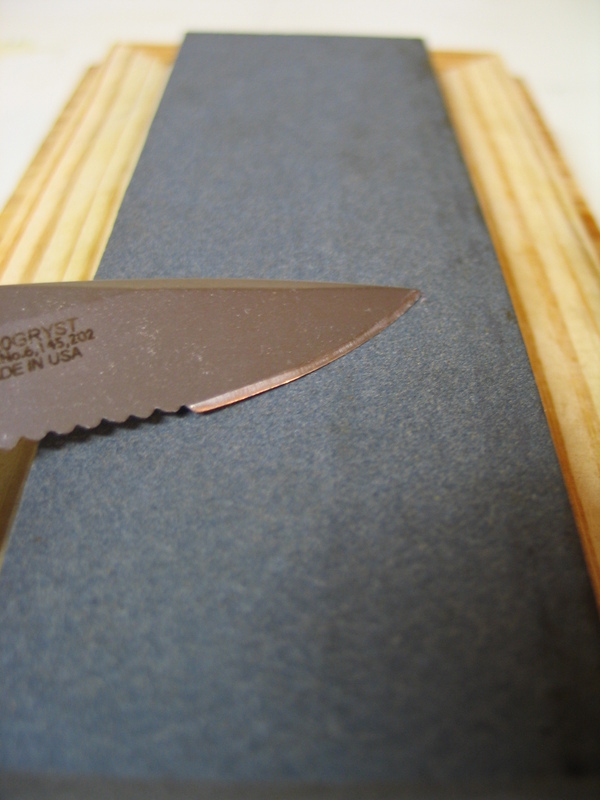 This past Christmas, my father once again recommended sharpening and thus the tradition lived on. This time we were at my house and I had no stone. My Dad planned ahead and purchased one for me a couple days earlier, anticipating the new Christmas tradition. 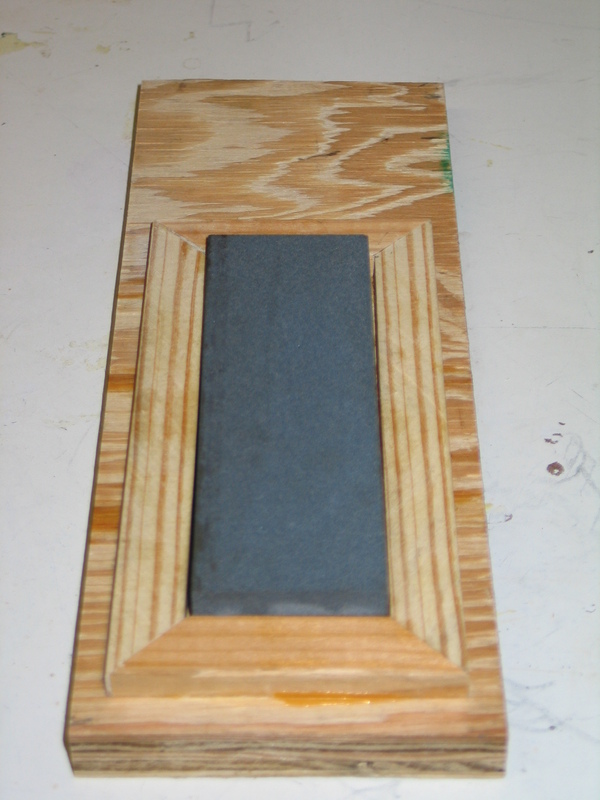 After we were all done, my father-in-law recommend I build a sharpening stone block to hold my new stone. We all agreed this was a good idea so I began a couple of days later. It’s just a piece of scrap plywood with a frame made of a pine strip I had leftover from the Radio Flyer rails project [update coming soon.] A few miter cuts on the table saw and some glue is all this took. After the glue dried, I finished with some light sanding to remove the excess. The open area at one end allows me to clamp the block down so it won’t slide around while in use. P.S. It’s half time of the Ohio State/Florida game. Ohio is down by 20 points and their band is playing “My Heart Will Go On.” They deserve to lose. This entry was posted on Monday, January 8th, 2007 at 10:49 pm and is filed under Life, Wood Working. You can follow any responses to this entry through the RSS 2.0 feed. You can leave a response, or trackback from your own site. I’m sorry now that we didn’t wait for Rick to be with us. I wanted to start another tradition, but chickened out. The original Owen Henderson only drank strong spirits once a year. He and Daddy would have an Egg Nog with whiskey on Christmas Eve. We’ll shoot for that one next year. Loveya. You should be shot to ever imply that Florida should win a game..
Hey! I saw that in your garage just last weekend. Now I know the rest of the story. I love that line about the pants. After 14 years of wedlock, we have a few of our own phrases we use. It’s part of the fun of sharing your life with someone else. But, we wouldn’t dare share some of ours. That’s part of the fun, too!